How to use nested quotes on the Runas command | Are you a user? This isn’t exactly SharePoint related, but it does deal with SQL Server (that is used by SharePoint) so I’m going to post it here anyways. So shoot me. To run SQL Server Enterprise Manager (Ouch! What is he doing with SQL 2000?) as another user from the command line you can either use short file names or nested quotes. C:\Windows\System32\runas.exe /user:domain\username "C:\Windows\System32\mmc.exe /s C:\Progra~2\Mi3EDC~1\80\Tools\BINN\SQLSer~1.msc"
If you want to use short filenames, you can cd to each directory and perform a dir /x to display the short directory or filename. 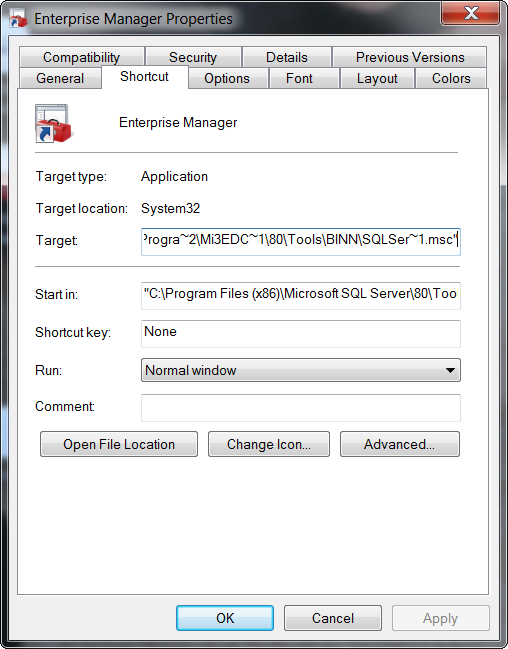 C:\Windows\System32\runas.exe /user:domain\username "C:\Windows\System32\mmc.exe /s \"C:\Program Files (x86)\Microsoft SQL Server\80\Tools\BINN\SQL Server Enterprise Manager.MSC"\"
The trick to using long filenames is to use \" for the first nested quote and "\ for the matching nested quote. In either case, when you run the shortcut you’ll be prompted to enter your password.